Gold Reef City Theme Park is a recreation of turn of the century Johannesburg on the site of the former Crown Mines 14 shaft. The shaft is still operational for underground visits to 5 level (220 metres). 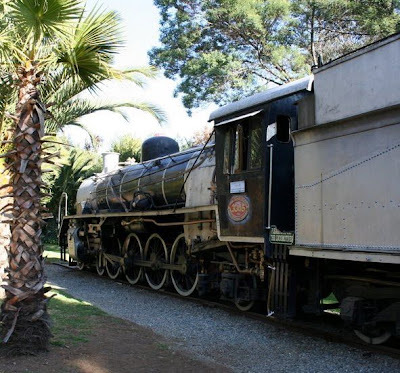 The locomotives at Gold Reef City are fairly well cared for. Note in the picture above the measures taken to prevent people from climbing into the cab. In the background, up the stairs, is the "gold carriage exhibition". The Garratt NG111 with its red livery is plinthed near the 19D. The next three photos document how a section of copper tubing below the firebox door becomes loose and disappears. ONE: The tubing is still intact. TWO: The tubing is loose on the left side. THREE: The tubing is gone. Apparently No 3345 was in SAR service from 1948 until 1986. No 3345 was built in 1948 by the North British Locomotive Co as works no 26065. Before WW II, 135 engines of Class 19D were delivered by Krupp, Borsig and Skoda. 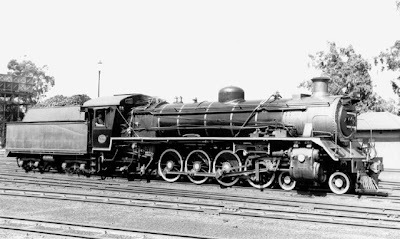 The Class 19D was very much like the Class 19C, but the rotary cam valve gear was dispensed with and replaced by Walschearts. 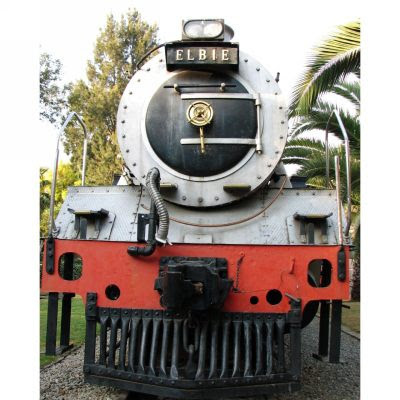 These engines became Class 19D and in every other respect were identical to the Class 19C. Immediately after the war, a further 50 Class 19D's were supplied by Robert Stephenson and Hawthorn Ltd. These were similar to the pre-war 19D, except they were fitted with vacuum brakes. 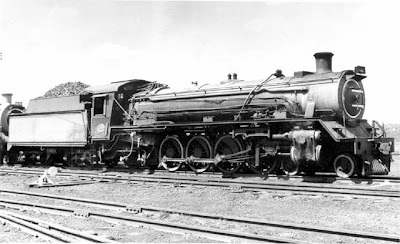 The final order of 50 engines of this class was from North British Locomotive Co in 1949 and fitted with a new type of tender known as the Vanderbilt. 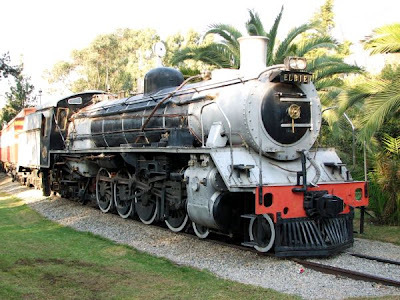 The 19D No 3345 locomotive plinthed at Gold Reef City has the traditional square shaped tender, but as it belongs to the last series (No's 3321-3370) it too would have been delivered with a Vanderbilt cylindrical tender, however somewhere along the line it was coupled to the traditional tender as on display here. For an example of a plinthed Class 19D coupled with a Vanderbilt cylindrical tender, see the entry for Volksrust. 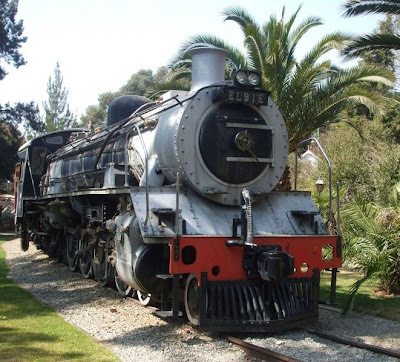 These versatile locomotives saw extensive service on every system of the SAR, and were amongst the last steam locomotives to be withdrawn from active service.